Let’s face it, a lot happens in life outside of our control. But tax uncertainty doesn’t have to be your tax reality. Just like the running of a dental practice is a unique animal within the health care industry, accounting practices for dentists should be too. And if your tax advisor doesn’t provide “dental-specific” accounting, surprises will remain unpleasant and erratic. As financial and business advisors for dentists/specialists in more than 30 states, Four Quadrants defines a tax surprise as any tax refund or taxes owed over $10,000 in a given year. So if that’s happening to you something is broken. Most accountants calculate your 2015 estimated taxes based on your prior year profits. This works great for the Q1 payment, but most accountants almost always fail to evaluate business profitability throughout the year. How does this happen? Say, for instance you have a year of decent growth and a drop in expenses. In a practice that collects $1 million a year your practice's net profit can easily swing more than $100,000. This translates into a $40,000 surprise your accountant didn’t detect. Most dentists are lucky to meet with their accountant once or twice a year. And when they typically have the “tax-planning meeting” late in the year, much of the opportunity to spot and avoid tax surprises has passed. A semi-annual or even quarterly reconciliation just won’t cut it. Outdated numbers lead to a lack of monitoring; this lack of monitoring means your accountant didn’t catch the $100,000 in profit until you have very little time to plan for it. How are you going to cobble together an additional $40,000 to cover a tax surprise from a situation that otherwise should be celebratory? As this snowball builds upon itself, you realize why so many people dread “April 15th.” Just as you pay for the mistakes of 2014, you will also have to pay the estimate for Q1 2015—the proverbial “double-whammy." How could an unexpected increase in revenue cause so much PAIN? If these examples sound familiar you’re not alone. In a desperate attempt to avert the pain above, many of your colleagues hoard cash. In other instances they ride the peaks and valleys of thick and thin monthly income waves pinching the pennies just in case. No matter who you are or what you produce, subjecting yourself, your employees, and your family to this cashflow roller coaster constricts your opportunity to build wealth long-term. The ultimate failure that results from bad tax planning is the inability to save enough for retirement consistently and we think that is an absolute tragedy that is often overlooked. 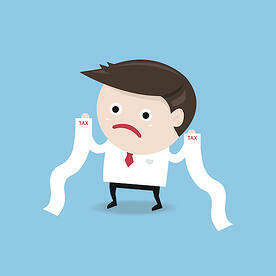 Planning to avoid tax surprises and calming tumultuous income waves is what we do. Ultimately it’s our goal for all of our clients to stabilize their practice income so they can save $100,000 or more each year for retirement. For more information, download our success kit or contact us today by filling out the form below! Every important relationship starts with a conversation. We like to start a conversation by asking questions that allow both a prospect and Four Quadrants determine where they are in their dental practice. The dentist discusses the issues they’re facing, how they’ve tried to solve them, and what has or hasn’t worked. We use that to determine whether or not the practice is ready for our brand of help. If so, we move on to the next step together. If not, we offer baseline materials to help get the practice to the right starting point. Click the play button on the video below to discover the Three Questions We Ask Every Prospective Client. . .